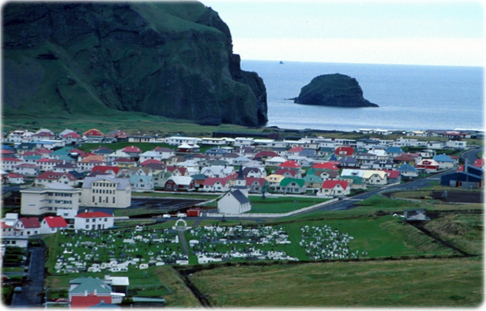 Settled by Norwegian and Celtic (Scottish and Irish) immigrants during the late 9th and 10th centuries A.D., Iceland boasts the world's oldest functioning legislative assembly, the Althing, established in 930. Independent for over 300 years, Iceland was subsequently ruled by Norway and Denmark. Fallout from the Askja volcano of 1875 devastated the Icelandic economy and caused widespread famine. Over the next quarter century, 20% of the island's population emigrated, mostly to Canada and the US. Limited home rule from Denmark was granted in 1874 and complete independence attained in 1944. Literacy, longevity, income, and social cohesion are first-rate by world standards. 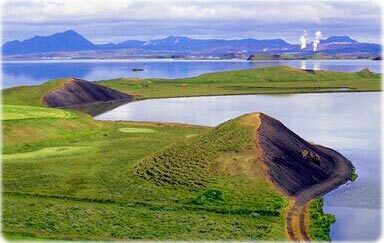 The Myvatn Lake with old volcanoes, Iceland. Iceland's Scandinavian-type economy is basically capitalistic, yet with an extensive welfare system (including generous housing subsidies), low unemployment, and remarkably even distribution of income. In the absence of other natural resources (except for abundant geothermal power), the economy depends heavily on the fishing industry, which provides 70% of export earnings and employs 12% of the work force. The economy remains sensitive to declining fish stocks as well as to fluctuations in world prices for its main exports: fish and fish products, aluminum, and ferrosilicon. Government policies include reducing the budget and current account deficits, limiting foreign borrowing, containing inflation, revising agricultural and fishing policies, diversifying the economy, and privatizing state-owned industries. The government remains opposed to EU membership, primarily because of Icelanders' concern about losing control over their fishing resources. Iceland's economy has been diversifying into manufacturing and service industries in the last decade, and new developments in software production, biotechnology, and financial services are taking place. The tourism sector is also expanding, with the recent trends in ecotourism and whale watching. Growth had been remarkably steady in 1996-2001 at 3%-5%, but could not be sustained in 2002 in an environment of global recession. Growth resumed in 2003, and inflation dropped back from 5% to 2%. Religions: Evangelical Lutheran Church of Iceland (official) 67.2%, Roman Catholic 3.9%, Reykjavik Free Church 2.8%, Hafnarfjordur Free Church 2%, Asatru Association 1.2%, The Independent Congregation .9, other religions 4% (includes Zuist and Pentecostal), none 6.7%, other or unspecified 11.3% (2018 est.). Ethnic groups: homogeneous mixture of descendants of Norse and Celts 81%, population with foreign background 19% (2018 est.). Language: Icelandic, English, Nordic languages, German. 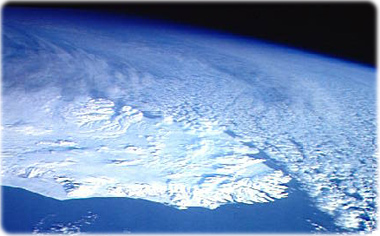 The east half of Iceland as seen from space.